And you didn’t register for the Institute of Genealogy and Historical Research (IGHR) or the Genealogical Research Institute of Pittsburgh for their June offerings. And you didn’t make it in to the 2017 Genealogical Institute on Federal Records (Gen-Fed). So what are you going to do to jumpstart your genealogical education for 2017? If you don’t mind a suggestion, there’s one more really good option that opens at noon Eastern time, Wednesday, March 8th, for the classes of the July session at GRIP — and those classes are going to fill up fast. 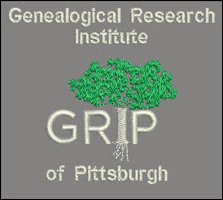 GRIP, of course, is the Genealogical Research Institute of Pittsburgh, going into its sixth season at LaRoche College in Pittsburgh. Co-directors Elissa Scalise Powell, CG, CGL, and Deborah Lichtner Deal have arranged for terrific courses offering in-depth immersion for an entire week — this session runs from July 16th to July 21st — in a topic that just might be what you’re looking for. Coordinators: yours truly, Judy G. Russell, JD, CG, CGL, and Richard G. “Rick” Sayre, CG, CGL, FUGA, with instructor Marian L. Smith of USCIS. This course is designed to give the family historian a leg up in understanding the legal lingo and concepts that impact — and create — the records we use every day in genealogical research. From court records to family law to estate and probate law to immigration and naturalization, this course explores the wide variety of legal concepts that gave rise to the records we need to accurately reconstruct our families. And it goes beyond the law to the records themselves, and particularly the government documents like pension and land records — and even FBI and prison records. Coordinator: Paula Stuart-Warren, CG, FUGA, with instructors Debbie Mieszala, CG, Melissa A. Johnson, CG, and Karen Mauer Jones, CG, FGBS. Coordinator: Melissa A Johnson, CG, with instructors Michelle Tucker Chubenko, Karen Mauer Jones, CG, and Judy G. Russell, J.D., CG, CGL. “New Jersey: Research in the Garden State” is designed for intermediate to advanced researchers who are familiar with how to use common genealogical records (census, church, land, probate, and vital records, for example) and are interested in learning about sources and strategies for researching New Jersey families. This course will cover New Jersey-specific federal, state, county, municipal, and private records useful for researching from New Jersey’s proprietary period through to the present day. Instructors will teach attendees about New Jersey records, how to access them, and how to use them for genealogical research. Examples, hands-on exercises, and case studies will be used to demonstrate how challenging New Jersey research problems can be solved. Coordinator: David E. Rencher, AG, CG, FUGA, FIGRS, with instructors Thomas W. Jones, Ph.D., CG, CGL, FASG, FUGA, FNGS and Richard “Rick” G. Sayre, CG, CGL, FUGA. Participants will acquire a solid foundation for their Irish research, whether just beginning, or they’ve been working at their Irish ancestry for some time. Hands-on class exercises and homework will enhance the learning experience with step-by-step instructions to take the course learning from theory to practice on the student’s own Irish research problems. Coordinator: CeCe Moore, with instructors Blaine Bettinger, Ph.D., J.D., Brianne Kirkpatrick, MS, LGC, and Karen Stanbary, CG. Coordinator: Blaine Bettinger, Ph.D., J.D. ; with instructors Patti Hobbs, CG; Thomas W. Jones, Ph.D., CG, CGL, FASG, Karen Stanbary, CG; CeCe Moore. Because this line-up is so solid, with new course offerings and more, class space is going to go fast. If you want in, you need to be ready to go when registration opens Wednesday, March 8, at noon Eastern, 11 a.m. Central, 10 a.m. Mountain and 9 a.m. Pacific.